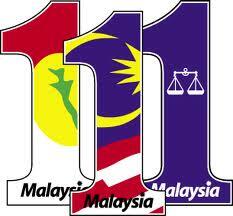 Malaysia’s 14th by-election since March 2008 scored another victory in the BN column, as they held onto their seat. This was expected, as it was home ground for UMNO and the contest was purely about the winning majority. Even with the lower voter turnout, UMNO did well with a comfortable and higher majority of 3,707. Rather than provide a numerical assessment of the voting results, let me share some broader observations and tensions that arise from the Tenang campaign. Despite the centrality of machinery and money, this election highlights the increasing challenges of engaging the diverse electorate in Malaysia. Arguably, the dynamics of the by-election in Johor muddy the waters, making the decisions about national electoral strategies and tactics even more complex. The most defining feature of this election was the weather. It was dreadful, and it negatively affected the polling. Watching voters drench themselves to vote, despite umbrellas, and wade in up to knee-high water to the polling station, made me question whether the by-election was worth the risks involved. I remain deeply puzzled why this by-election was not postponed. I woke up the morning of the poll thinking that it might already be time for Noah’s Ark as the overnight downpour had already affected roads and submerged parts of the constituency. The fact that four polling stations (30 percent of the stations) were inaccessible by early afternoon made this question even more salient. It is fortunate that no one was seriously hurt and some voters were able to navigate the slick hazardous conditions, as the decision to continue with the polls appeared irresponsible. Voters, however, braved on. They believed strongly in their civic responsibility to vote, to have their opinion recorded despite the inconveniences involved in casting it. This speaks to an important feature of Malaysian politics, that even despite lackluster campaigns on both sides, when asked to act responsibly, to fulfill their roles as citizens, they do so. It was not only a matter of reward or partisanship, but a deep-seated desire both to be heard and be part of the national political landscape. Johoreans, in particular, feel left out of the excitement, and don’t like to be ignored. What was striking is that the weather highlighted perhaps the biggest governance problem locally – flooding. While it is easy to think that climate change and heavy rain were responsible, the fact remains that flooding is also man-made. The land development practices of clearing land and failure to adequately monitor deforestation have contributed to the high siltation of the streams and river and created increased vulnerability to flooding. The low-lying areas are well-known, but the problem has clearly been inadequately addressed. Part of the problem is that flooding lies in the multiple jurisdictions of state and federal authorities, but this should not have been an excuse in Johor. The infrastructure is not up to par, and regular flooding is now the norm. 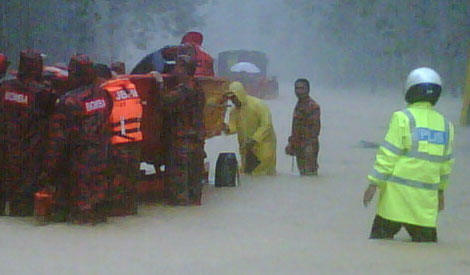 Just a few years ago, areas in Johor were completely submerged. 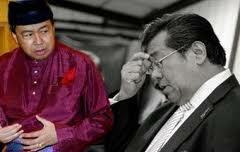 This by-election is a wake-up call to the BN government to act responsibly. The Tenang by-election showcased the problem of flooding that is now frequent in semi-rural areas throughout the country. It is a national problem that needs attention. Many of the voters who opted for the BN did so with the hope that conditions would improve in the future, that their civic responsibility would yield a more responsible government response. The reasons people voted as they did are not so easy to capture. Three interesting features stand out. First, the focus among voters was on the party rather than the candidate. 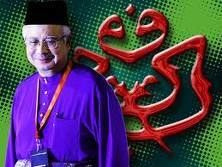 For BN voters, the dominant thread was loyalty to UMNO. For the majority of opposition voters, the focus was primarily on Pakatan Rakyat. Chinese voters were not as scared off with the Islamic State tactics, while those loyal to PAS continued to feel both a connection to the Islamic Party and its cooperation with other component partners. In other by-elections, the candidate chosen was decisive. Here, given the credentials of both candidates, party emerged as more central. This suggests that while the choice of candidate may be increasingly important in urban areas, the image and identity of the party remains central in more semi-rural communities. Both of the main parties concerned – UMNO and PAS – have challenges in improving their images and profiles in parts of the country, especially those where they have limited machinery or tainted images. Another feature of Tenang was the lack of political awareness or interest. Many, especially in the more rural areas, had never even heard of Pakatan and many were just not interested in politics. The intense politicking followed closely by Malaysiakini readers does not permeate the lives of Tenang voters, and they like it that way. Unlike Sibu, there was not a major political awakening in Tenang and voters did not relate to many of the opposition concerns about corruption and justice. This is a challenge politically, as many outside of urban centres have limited sources of political information and do not connect with issues touted by the urban-based political leaders the same way. Take ‘Interlok’, for example. This book was seen as distant from the life experience of voters. Meshing political issues with local outlooks remains a challenge across the political spectrum. Finally, given the dominance of UMNO and its close relationship to government officials, one of the most difficult issues involves the blurred lines between government and party. The nasty weather conditions brought this to the fore, as police, fire officials, rural development authorities and election officials faced real challenges in managing their jobs neutrally. The scarce resources of boats and equipment added to the perception – deeply held in the Chinese-majority areas where assistance was less forthcoming – that civil servants did not respond fairly. It was exacerbated by the perception and reality that voting cut along ethnic lines and added to the view that the response was ethnically biased. Further investigation is needed to assess this, but the perception remains and is a product of the government’s failure to draw sharp lines between what is for the party work and what belongs to the citizens at large. Given the multiple jurisdictions of governance and increased competitiveness, the need for civil servant neutrality is even more pressing. Any election should ultimately not rest on the selective use of government resources for the interest of any party. It makes the victory hollow, and raises ethical concerns and feeds unnecessarily into the increasingly racialised political lens. As the waters subside, there are two political parties that have the most soul-searching to do. First is PAS. They are losing Malay ground in semi-rural areas. While in fairness, they had little support in the first place in Tenang, this election taken with the totality of results in the past few elections, including Galas in Kelantan, suggest some serious rethinking. The challenge for PAS is how to gain support in semi-rural areas that are multi-ethnic constituencies, e.g. Galas, Tenang and Merlimau, especially those in western and southern parts of Peninsular Malaysia. The Islamic State agenda polarised the electorate creating a zero-sum dynamic. Finding an identity that is inclusive, across races, and does not put pressure on Pakatan partners is not easy. The recent by-elections point to PAS’ Malay deficit, one that is focused in some areas more than others. 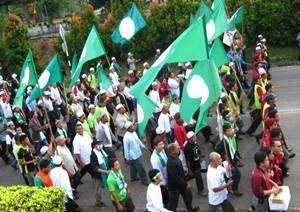 PAS is not able to effectively engage FELDA settlers and break into traditional UMNO ground. Despite the strong candidate, PAS appeared less connected to voters in Tenang than it did elsewhere. For the BN, Tenang was MCA’s test in its strongest base. They did not deliver. 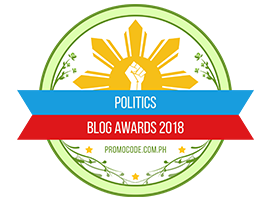 The money, the promises, the Islamic State bogey, the personal presence and the month-long campaigning tied to the Chinese New Year did not win additional votes. There was no major swing back to MCA in its core political ground. This spells trouble for the party as it relies heavily on UMNO for its seats and is unable to be seen as a strong representative of the Chinese community. The fact that very few young Chinese voters came back from Singapore to vote (many from Kuala Lumpur did, however) is even more telling for MCA. The results could have been worse. Like PAS, the MCA faces the challenge of redefining its political identity and engagement. It can see first-hand how MIC and Gerakan have weakened, and MCA – along with perhaps PBB (Parti Pesaka Bumiputra Bersatu Sarawak) – remains the last party standing that has some autonomy besides UMNO. The choices ahead for MCA are as difficult as those of PAS as it balances its subservient role in the BN with the need for its own survival. It is fitting that the next by-election is in a similar mixed-race constituency in a semi-rural area. Pakatan will face an uphill battle there as well. Campaigning has started already. One hopes that the all the parties go beyond the shallow and negative messages and “goodies” that have dominated Tenang. 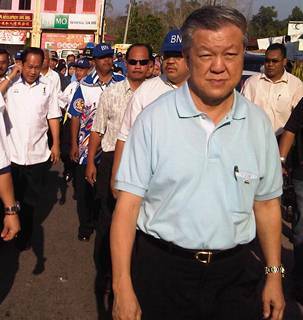 It is the last round pre-Sarawak contest before the next general election. Both sides are weary and the fatigue is showing. Yet if yesterday’s polls are illustrative, the parties have to step up their game and give more responsible and positive options to voters to deserve the level of national commitment to Malaysia’s future that the Tenang voters showed by voting despite having to wade through very muddy waters. *DR BRIDGET WELSH is associate professor of political science at Singapore Management University. 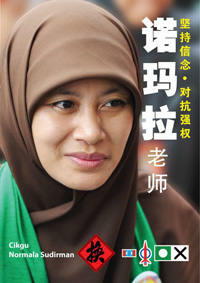 She was in Tenang to observe the by-elections. Welsh can be reached at bwelsh@smu.edu.sg. It has indeed been a strange and surreal one month in Selangor. You have the spectacle of a state government grappling with the problem of having as its top civil servant a person who is not to its liking. And all the time while doing this, it had neither the courage nor the honesty to admit what the real problem is. Thus, it is like trying to untie a bothersome knot without knowing where the ends of the rope are. You’ll just end up looking like a fool. The real problem that the Menteri Besar of Selangor has to contend with is not Mohd Khusrin Munawi per se, but rather the poor relations that the MB has with the Palace. Had the Palace decided that it would agree with the advice of the MB to change the recent appointment of the state secretary after the slip-up caused by the MB’s own tardiness in responding to the Public Service Commission’s request for the state’s list of nominees, the impasse would have been broken or wouldn’t have arisen in the first place. So, because he didn’t have the courage or the honesty to admit to his failings, the MB went about to untie the knot without knowing where the ends of the rope are. Muddle-headedness and blunders inevitably ensued. The first was to succumb and dance to the opportunistic tune of his political detractors that anything which smacks of being critical of the palace constitutes sedition or ‘derhaka’ (treachery). This is a total misreading of public sentiment on the matter. The MB seems to have forgotten that when Mahathir Mohamad pushed through the 1993 constitutional amendments on the role of the monarchy, cheered on by his ever so willing deputy Anwar Ibrahim, support for the amendments was enormous from both sides of the political divide. No one accused anyone of being treacherous. The public did and probably still do want the monarchy’s role to be limited and better defined constitutionally. In the present state secretary impasse, however, his detractors’ opportunistic pro-royalty stance was vociferous enough to cow the MB into deciding that it was politically unpalatable for his party to even let out a whimper calling for the palace to stick to constitutional forms and conventions. From then on, everything that happened was in the realm of charades with all sides involved assiduously ignoring the elephant in the room, which was the deviation from constitutional conventions. The second blunder was to personalise the impasse into the person of Mohd Khusrin. Despite its past disdain for his actions when he was the head of the state religious department, the state government should have had the discipline and clarity of thought to maintain that the issue at hand was not about the personality but the manner by which the appointment was made. That is to say, had the best civil servant in the country been appointed as state secretary in the same said manner, the state government would still have objected because constitutional norms and conventions had not been abided with. But to take such a principled stand, sadly, seems to be a notion so very alien to a government which purports to be the champion of Reformasi and Ketuanan Rakyat. The third blunder was to resort to amending the state constitution to grant more powers to the palace in the appointment of the top three civil service posts on the state. By what strange logic such a move would solve the MB’s problematic relationship with the palace, no one could fathom. That the attempt would fail must certainly had been anticipated by the state government. So the exercise of a special sitting to amend the state’s constitution could be put down as a feeble attempt in political point-scoring and to ‘democratise’ the impasse by trapping the state assemblymen from the opposition to declare whether they are ‘pro-rakyat’ or otherwise, in accordance to the MB’s perverted sense of logic. That’s putting it kindly. What seems to have escaped the MB is that it also gives the impression of a government wanting to make wanton use of constitutional amendments to cover up its own leadership shortcomings and incompetence. How different then is a Pakatan Rakyat government from any other ruling party in its blase attitude towards the sanctity of the constitution? After all that has been said and done, the state government is back at square one and nowhere near solving the impasse. 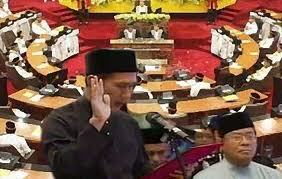 Astonishingly, the MB now appears amenable to having Mohd Khusrin as the state secretary. So what was the previous one month all about? One can only assume that he’s finally realised that he has been trying to untie a knot without knowing where the ends of the rope are – and has only managed to look like a fool in the process. If there is one lesson from all these, it is that if we want ketuanan rakyat and genuine reformasi, we won’t get it from spineless and gormless political leaders, such as the ones you have in the Selangor state government. My sympathies go out to all those honest folk who really thought those same politicians had the courage and competence to achieve those goals. God permitting, the truth about these pretenders to the throne will be revealed sooner rather than later. Posted in Democracy, Governance, Politics. Asia has an inflation problem. The sooner it comes to grips with its problem, the better. Unfortunately, the appropriate sense of urgency is missing. Willingness to tackle inflation is impeded by Asia’s heavy reliance on exports and external demand. Fearful of a relapse of end-market demand in a still-shaky post-crisis world, Asian policymakers have been reluctant to take an aggressive stand for price stability. That needs to change – before it’s too late. Excluding Japan, which remains mired in seemingly chronic deflation, Asian inflation rose to 5.3% in the 12 months ending in November 2010, up markedly from the 3.5% rate a year earlier. Trends in the region’s two giants are especially worrisome, with inflation having pierced the 5% threshold in China and running in excess of 8% in India. Price growth is worrisome in Indonesia (7%), Singapore (3.8%), Korea (3.5%), and Thailand (3%) as well. Yes, sharply rising food prices are an important factor in boosting headline inflation in Asia. But this is hardly a trivial development for low-income families in the developing world, where the share of foodstuffs in household budgets – 46% in India and 33% in China – is 2-3 times the ratio in developed countries. At the same time, there has been a notable deterioration in underlying “core” inflation, which strips out food and energy prices. Annual core inflation for Asia (excluding Japan) was running at a 4% rate in late 2010 – up about one percentage point from late 2009. A key lesson from the Great Inflation of the 1970’s is that central banks can’t afford a false sense of comfort from any dichotomy between headline and core inflation. Spillover effects are inevitable, and once a corrosive increase in inflationary expectations sets in, it becomes all the more painful to unwind. The good news for Asia is that most of the region’s monetary authorities are, in fact, tightening policy. The bad news is that they have been generally slow to act. Financial markets appear to be expecting a good deal more Asian monetary tightening – at least that’s the message that can be drawn from sharply appreciating Asian currencies, which seem to be responding to prospective moves in policy interest rates. Relative to the US dollar, an equal-weighted basket of 10 major Asian currencies (excluding Japan) has retraced the crisis-related distortions of 2008-2009 and has now returned to pre-crisis highs. Export-led economies, of course, can’t take currency appreciation lightly – it undermines competitiveness and risks eroding the country’s share of the global market. It also invites destabilizing hot-money capital inflows. Given the tenuous post-crisis climate, with uncertain demand prospects in the major markets of the developed world, Asia finds itself in a classic policy trap, dragging its feet on monetary tightening while risking the negative impact of stronger currencies. There is only one way out for Asia: a significant increase in real, or inflation-adjusted, policy interest rates. Benchmark policy rates are currently below headline inflation in India, South Korea, Hong Kong, Singapore, Thailand, and Indonesia. They are only slightly positive in China, Taiwan, and Malaysia. The lessons of earlier battles against inflation are clear on one fundamental point: inflationary pressures cannot be contained by negative, or slightly positive, real short-term interest rates. The only effective anti-inflation strategy entails aggressive monetary tightening that takes policy rates into the restrictive zone. The longer this is deferred, the more wrenching the ultimate policy adjustment – and its consequences for growth and employment – will be. With inflation – both headline and core – now on an accelerating path, Asian central banks can’t afford to slip further behind the curve. Asia has far too many important items on its strategic agenda to remain caught in a policy trap. This is especially true of China, whose government is focused on the pro-consumption rebalancing imperatives of its soon-to-be-enacted 12th Five-Year Plan. So far, the Chinese leadership has adopted a measured approach to inflation. Its efforts focus mainly on increasing banks’ mandatory reserve ratios while introducing administrative measures to deal with food price pressures, approving a couple of token interest-rate hikes, and managing a modest upward adjustment in the currency. The mix of Chinese policy tightening, however, needs to shift much more decisively toward higher interest rates. With the Chinese economy still growing at close to 10% per year, the government can afford to take more short-term policy risk in order to clear the way for its structural agenda. Indeed, China’s dilemma is emblematic of one of developing Asia’s greatest challenges: the need to tilt the growth model away from external toward internal demand. That can’t happen without increased wages and purchasing power for workers. But, in an increasingly inflationary environment, any such efforts could fuel an outbreak of the dreaded wage-price spiral – the same lethal interplay that wreaked such havoc in the United States in the 1970’s. Asia can avoid this problem and get on with the heavy lifting of pro-consumption rebalancing only by nipping inflation in the bud. Much is made of Asia’s Teflon-like resilience in an otherwise tough post-crisis climate. Led by China, the high-flying economies of developing Asia are increasingly viewed as the new and powerful engines of a multi-speed world. While the jury is out on whether there has really been such a seamless transition of global economic leadership, Asia must face up to the critical challenges that may come with this new role. Inflation, if not addressed now, could seriously compromise the region’s ability to meet those challenges. 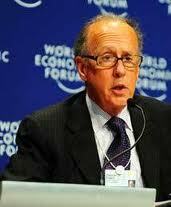 Stephen S. Roach, a member of the faculty of Yale University, is Non-Executive Chairman of Morgan Stanley Asia and author of The Next Asia. AS a relative youngster, politics has always been like a love-hate relationship for me. We love how politics can ignite passionate debates about right and wrong, yet we hate how it manages to transform everything good into something evil. So when I was asked to review this book, I took it up as a challenge to delve into a world that I admittedly do not know much about but always had a dormant interest in. This was one of the first books to come out after the landmark March 8, 2008, elections, when the Opposition won an unprecedented number of Parliamentary seats. 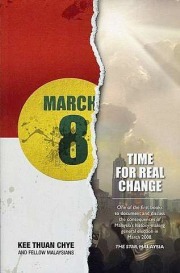 Back then, it was entitled March 8: The Day Malaysia Woke Up. Time for Real Change is a re-issued edition with new content released late last year – and very timely it is, too, what with the number of by-elections that have taken place lately and rumours of the next general election swirling about the World Wide Web. Let us get some things straight before we start off. March 8 is not a book about politics. It is a compilation of many thoughts that run parallel to a man’s dream of living in a nation where equality, justice and true freedom are the rule of thumb. Is that too much to ask? In this day and age, it probably is. Here’s a quick re-cap of the events that sparked the first version of this book (for those of you who might have, by some wild chance, missed it all): On that fateful day three years ago, for the first time since the 1969 general elections, the ruling coalition of Barisan Nasional failed to secure the two-thirds majority in Parliament required to pass amendments to the Malaysian Constitution. This represented a major shift in power, with the Opposition parties having a larger say in Parliament and greater control over amendments to the law. 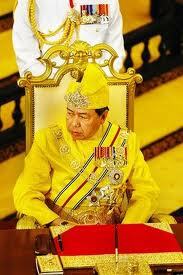 More importantly, it proved to Malaysians that the once-impenetrable has finally encountered kryptonite. This book is made up of three main sections. The first, Where We Are Now, evaluates the significance of events in the aftermath of the general election. This includes the ruling coalitions’ attempts to instil change and reform. The middle section, Back to the Beginning, chronicles the events that culminated in March 8, while the last, Where Do We Go From Here, discusses the future of our nation and the growing hope for change that seemed so bright on that fateful day. Kee Thuan Chye, the editor (and also contributing writer) of the book, is a dramatist, poet and retired journalist. From the first page, it was fascinating to see him using his expertise in all three fields to pull us in with smooth-flowing sentences and words that are easy to understand (which is something most authors tend to forget). His summation of events leading up to March 8 and its aftermath paint a clear picture, without our needing to go to Google and look up specifics details. Kee’s voice is always distinct amidst all the facts and statistics, his frustration with the current political landscape is clearly delivered. In all the sections, a number of well-respected names share their thoughts on the historic general election and its repercussions. Penang Chief Minister Lim Guan Eng and controversial Malaysia Today editor, Raja Petra Kamarudin lead the voices in the call for change and democracy. With most books, it is not unusual for us to feel as though we are reading behind a glass wall, with the author telling us the story. In this book, however, Kee writes with a personal touch, emphasising phrases such as “we have to do our part” and “we continue to support it”. We get the impression that he is on our side of the wall, pointing out to the world and telling us what is really going on out there. As someone just starting to get the hang of politics, John Lee’s article, Youth Votes Count for Everything, speaks to me in particular. Lee states that although a minority of the younger generation cares passionately about the political landscape, most are just not interested. He then goes on to argue that although this remains an issue, the March 8 general election has produced positive change by increasing the interest in the young as they begin to realise the power of their votes and, essentially, their voice. With the advent of political blogs, “Twittersphere” and social media, the point that Lee makes resonates loudly, as the younger generation could well prove to be the turning point in the next general election. Readers will find his book eye-opening as it drags you in from the very start and inspires you to believe that while real change and true democracy may be improbable, they are certainly not impossible. Posted in Book Review, Democracy, Governance, Human Rights, Media, Politics. This is a question which many Malaysians are asking in the wake of people power and street demonstrations which have rocked several Muslim countries such as Tunisia, Egypt and Jordan. Barisan Nasional’s (BN) 3,707-vote majority win in Tenang within its Johor stronghold shows that the ruling coalition remains popular among the electorate although it has failed to regain the Chinese vote, a major block in most urban areas. However, opposition politicians like to believe that the conditions are ripe for a similar style uprising here, citing repressive practices and endemic corruption by the BN government. On the flip side, government leaders say that the situation in Tunisia, Egypt and Malaysia is as different as night and day, noting that the Southeast Asian nation has full employment, with the people having full stomachs and the country is a democracy with regular elections. For now, BN leaders are correct. And Azahar Ibrahim’s 6,699 votes against PAS’s Normala Sudirman’s 2,992 in the country’s 14th by-election since Election 2008 show that the ruling coalition has the policies that keep attracting support. • Turning a blind eye to endemic corruption, especially among ministers, government politicians, royals and those connected to the leadership. Because this is a rich country, Malaysians generally do not go beyond complaining when they wonder how ministers and politicians can own a fleet of luxury cars, own luxury homes in London, afford to put their children in boarding schools and have their wives decked in million ringgit jewels when their monthly salary is not more than RM15,000 a month. For now, the Malaysian reaction is a mixture of amazement, frustration and envy. But as the events in Tunisia show, pent-up anger over endemic corruption can push ordinary people to do drastic things. 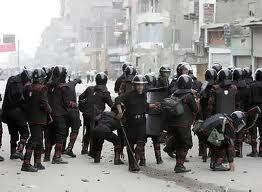 • President Hosni Mubarak has ruled Egypt with a strong hand, supported by secret police and the military. He has refused to give any democratic space and frustration has built up to explosion point because many Egyptians believe that the system is stacked against them. 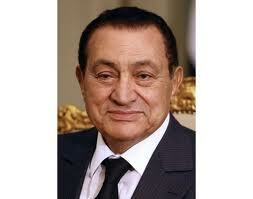 persecuted.Mubarak has weakened all the institutions and bent it according to his will. The situation in Malaysia is a long way from Cairo but this situation will only continue if the government understands that rules of fair play and justice must be adhered to by institutions, whether it is the judiciary, police, MACC, Election Commission and other institutions. 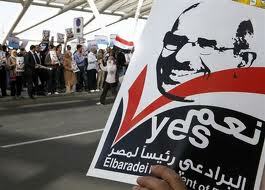 Mubarak believed that as long as he had the military might behind him he could run Egypt as his fiefdom. The point is that tolerance has its breaking point. The turmoil, in which more than 100 people have died, has sent shock waves through the Middle East where other autocratic rulers may face similar challenges, and unsettled financial markets around the globe as well as Egypt’s allies in the West. The final straw seems to have been parliamentary elections in November last year, which observers said authorities rigged to exclude the opposition and secure Mubarak’s ruling party a rubber-stamp Parliament. The military response to the crisis has been ambivalent. Troops now guard key buildings after police lost control of the streets, but have neglected to enforce a curfew, often fraternising with protesters rather than confronting them. It also remains to be seen if the armed forces will keep Mubarak in power, or decide he is a liability to Egypt’s national interests, and their own. It was also unclear if Mubarak had decided to talk with the generals or if he was summoned by them. It was Tunisian generals who persuaded former President Zine al-Abidine Ben Ali to flee last month after weeks of protests. That has not happened in Malaysia, even in 1998 at the height of the Reformasi protests against the sacking of then-Deputy Prime Minister Datuk Seri Anwar Ibrahim. A series of desertions and a sacking from Anwar’s PKR have shown that the de facto PKR and Pakatan Rakyat (PR) leader has still to come to grips with controlling his party rather than challenging Prime Minister Datuk Seri Najib Razak for Putrajaya. The latest polls result from Tenang appears to reflect that BN is regaining most of its support from the Malays, who deserted the ruling coalition in 2008, and the Indians who appear to have benefited from the Hindraf march in November 2007. However, it has yet to receive more support from the Chinese, the country’s second-biggest community but the most dominant in business. An editorial in UMNO-owned Mingguan Malaysia weekly yesterday urged the government to curry favour with the Chinese to ensure continued support in the next general election amid concern that the situation in the Middle East could find its way to Malaysia. With BN now winning six out of 14 by-elections since Election 2008, all eyes will be on the 15th by-election in Merlimau, Melaka on March 6, two days to three years since the last general election, to see if the ruling coalition can maintain their momentum and win the Malacca seat. Growing support for the Najib administration in the past few by-elections will help assure the government that Tunisia and Egypt will not happen in the country in the near future.It will also keep the opposition in check but the Najib administration will have to continue with its reforms to ensure it remains in power. Otherwise, it will be a matter of time before protests grow like in Tunisia or Egypt and even in Indonesia more than a decade ago. Posted in civil society issues, Democracy, Economy, Governance, Holistic and Balanced Development, Human Rights, International Affairs, Politics. 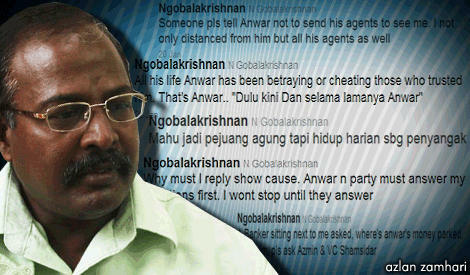 Padang Serai member of parliament N Gobalakrishnan has quit PKR, making him the sixth PKR MP to become an Independent. “I have stepped down from all posts in PKR and will continue my work through a new NGO,” said his twitter posting this morning. Gobalakrishnan, who called a press conference this morning at his Padang Serai office in Kedah to make the annoucement, told Malaysiakini that he is now an independent MP with immediate effect. Four other MPs have quit PKR since the 2008 general elections to become Independents – Zahrain Mohd Hashim (Bayan Baru), Tan Tee Beng (Nibong Tebal), Mohsin Fadzil Samsuri (Bagan Serai) and Wee Choo Keong (Wangsa Maju) – while another, Zulkifli Nordin (Kulim-Bandar Bahru), was sacked from the party. PKR now has 23 seats in the Dewan Rakyat, down from 31 after the March 2008 general elections, while DAP has 29 and PAS, 23. BN will need another four defections to reclaim its much-coveted two-thirds majority in Parliament. The magic figure for the ruling coalition is 148, and it will be able to achieve this with its 138 seats along with the support of the existing seven BN-friendly independents (including Pasir Mas MP Ibrahim Ali) plus another four. Gobalakrishnan’s move today on the eve of the Tenang by-election appeared to follow the same pattern as Wee, who announced his resignation from PKR two days before last year’s May 16 Sibu by-election. Gobalakrishnan said his decision to quit the party came after a visit from one of PKR deputy president Azmin Ali’s “strongmen”. But he declined to name the visitor. “They thought I will toe the party’s line, but after seeing so much that had happened in the party, I have no choice but to quit,” said Gobalakrishnan. “They have been planning to get rid of me and have already assigned someone else to do the work in Padang Serai (constituency),” he added. Gobalakrishnan nevertheless expressed sadness over his departure from the party as he had been with the party for over a decade. “But I will continue to provide my service to the people here,” he vowed. Gobalakrishnan will however not be joining Zahrain’s Independent Consensus nor Zaid Ibrahim’s newly launched Kita, or People’s Welfare Party. He said he would instead be dedicating his efforts to set up a new NGO to focus on social development and supporting places of worship. Gobalakrishnan’s recent tirade against party leaders had recently earned him a 45-page show-cause letter, which he had refused to reply. In the December 31 letter, he was asked to show cause, failing which, the party’s disciplinary board will decide on his fate. According to Section 27.7 of the party’s constitution, this may include terminating his PKR membership, stated the letter. Gobalakrishnan, a former PKR supreme council member, has gone on the ‘twitter’ warpath against the party leadership, claiming that last year’s party elections were rigged. In the course of his various criticisms, he had demanded that party de facto leader Anwar Ibrahim to step down, before he appeared at the home of the party’s biggest dissident Zaid Ibrahim, who has since quit the party to form Kita. Gobalakrishnan has also lambasted the party for appointing political novice N Surendran as vice-president, claiming that the latter was not capable of representing the Indian community as he could not speak Tamil fluently. One of the top contenders for PKR vice-president, Gobalakrishnan had harboured hope that he would be appointed into the post when he failed to win the top four spots. Posted in civil society issues, Democracy, Human Rights, Politics.